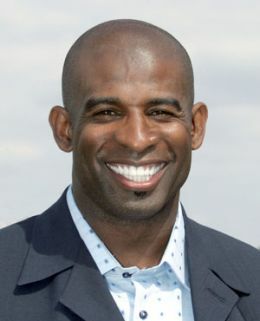 DALLAS — Deion Sanders always was Prime Time. Now he's All Time. Sanders and Marshall Faulk led a class of seven voted into the Pro Football Hall of Fame on Saturday. Joining them were Shannon Sharpe, Richard Dent, Ed Sabol, Les Richter and Chris Hanburger. As talkative as he was talented, known as much for his celebration dances as his interceptions and kick returns, Sanders was an outstanding cornerback and sometime wide receiver with five teams. He's a two-time Super Bowl winner and was the Defensive Player of the Year in 1994. Sanders reacted to his election with typical Neon Deion bravado. He said he's grateful, but then made sure to explain, "what you feel about me has nothing to do with how I feel about me." Then he broke into the open field. "Next to the Bible, my favorite book was 'The Little Engine That Could.' I read that story so many times, I know it by heart," he said. "And a couple trains passed that engine until he started saying to himself: 'I think I can. I think I can. I think I can.' And that's what I modeled my career after. I mean, it sounds arrogant, it sounds brash, it sounds cocky. But it was real." Sanders also played major league baseball. But football clearly was his calling. "He was an electrifying performer who put fans on the edge of their seats every time he manned his cornerback position or dropped back to receive a kickoff or field a punt," Falcons owner Arthur Blank said. "Deion is, without question, one of the greatest players in the history of the NFL." Sanders got in a comical dig at Faulk and Sharpe. "Man, this is real," he said, "and I got to see Marshall Faulk and Shannon Sharpe cry." Faulk won a Super Bowl with the 1999 Rams, was the 1994 Offensive Rookie of the Year, 2000 NFL MVP and a three-time Offensive Player of the Year (1999-2001). Faulk is the 10th leading career rusher with 12,279 yards, and for a half-dozen seasons was the most versatile back in football, as much a threat as a receiver as a runner. "I wanted the ball in my hands so I could so something with it," Faulk said, recalling how he briefly played quarterback in high school and didn't find it exciting enough. Faulk got teary-eyed when asked how his mother reacted to his election. Sharpe starred for Denver and Baltimore for 14 seasons and won three Super Bowls in a four-year span, two with Denver, one with Baltimore. He held league records for a tight end in receptions, yards and touchdowns when he retired in 2001. "If I had a thousand tongues, I couldn't say how happy and proud I am," Sharpe said. "I don't know what I did to deserve this. "This caps off a tremendous football career by a guy who truly was self-made and worked his tail off to become one of the best players in the history of the NFL," said Elway, who was Sharpe's quarterback in Denver. Sharpe always knew football was going to be his profession. "If you are going to have letters behind your name, I wasn't going to have M.D. or PhD. HOF is pretty good," he said. Induction ceremonies are Aug. 6 in Canton, Ohio. Well overdue. This guy was sort of the Michael Jordan of football. Not to mention he played baseball simultaneously.